from the Eddie's Club Collection. Mark Gibbons is one of my favorite poets. Every time I open one of his books, I can't put it down until I've read the entire thing. It's the kind of book I look forward to reading and rereading. Mark has a gift for telling it like it is. I feel like he speaks the kind of language I think in. He sounds like someone I know. His poems are wise, funny, and filled with a good heart. Mark Gibbons is no stranger to poetry. As in his previous collections, he once again engages his reader in a lively exchange with experience as it comes to him, head on. Whether through memories of friends and family, or through love and its inevitable loss, these poems face their truth unflinchingly. Gibbons is a beat Montana poet, one of the best, whose poems dance in a rhythmic celebration of a life lived one step at a time. and to each other water cool and pure. Steeped with substance, Mark Gibbons' poetry navigates our ever morphing world and reasserts poetry into its proper populist tradition. As tireless as Cuchulain, he accomplishes this task one poem at a time, one line at a time, one word and one note at a time, brilliantly chronicling forgotten voices and the marvelous places they call home. The Undercards and The Journeymen. doesn't try to impress you...just is...bleeds and sings. Or just blurt out what I don't understand? Watch me slip into vulnerability? We have a lifetime in Gibbons' poems, picking them up, carrying them to the right spot inside us before putting them down, letting them settle into their own arrangement for privacy or company. If the poem and the photograph had met on the road to Damascus, what they could reveal, together, is something I would describe as a vision. A good poem shapes a picture in its words. A good photograph is a story made in the moment of exposure. Together they create their own new and unique form. What Mark gives in these words is grit balanced in some way with humor, and you can see that great smile looking back from his skies, while at the same time he's holding you. On the other hand, Lee allows us to stand almost too close as we look in and out of the eyes of his portraits' faces. What a thrill it is to read and see through the eyes of Mark Gibbons and Lee Nye together in this text. Thank you, gentlemen, for your friendship and your vision. thrown into a tepid sea. Lee Nye was one of the seminal photographers of Montana. Born in 1926 in Hysham on the great plains of Eastern Montana, he was a child of the Great Depression and a dying West. He understood the cowboys, miners and loggers because he was one of them, yet he was also a catalyst for the art and writing scene in Missoula in the 60's and 70's. As a dual art and English major during the day and the iconoclastic bartender at Eddie's Club in the evening, he helped put Missoula on the map as one of the places to be. Nye and his photos are the "leitmotif" that connects the prose and poetry of the Montana writers. In 1970, Mark was in a poetry workshop at his high school taught by an unknown Indian poet, James Welch. A student of Richard Hugo's, Welch gave Mark permission to write poetry in his own voice, out of his life experiences. He's been writing ever since. His poems have appeared in numerous journals and anthologies. His first chapbook of poems, Something Inside Us, was self published in 1995, and a second, Circling Home, won the Scattered Cairns Press chapbook competition in 1999. 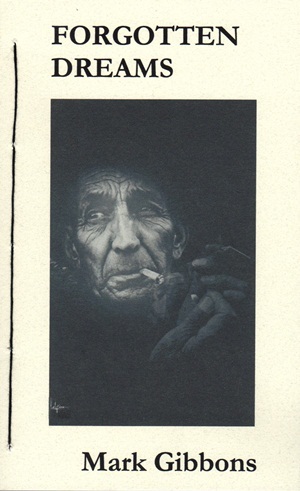 Connemara Moonshine, the first full length collection of his poetry, was published in 2002 by Camphorweed Press, followed by blue horizon in 2007 from Two Dogs Press. War, Madness, & Love, a collaborative collection of poems with Appalachian poet Michael Revere appeared in 2008, R & R Publishing. Mauvaises Herbes, a bilingual translation of his poems into French, was published in 2009 by PROPOS2 editions, France. 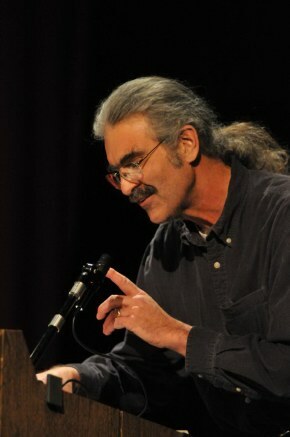 Mark lives in Missoula with his wife, Pam, and their two cats, where he teaches poetry for The Missoula Writing Collaborative. is a 104 page hand-sewn paperbook with spine - $16.00.